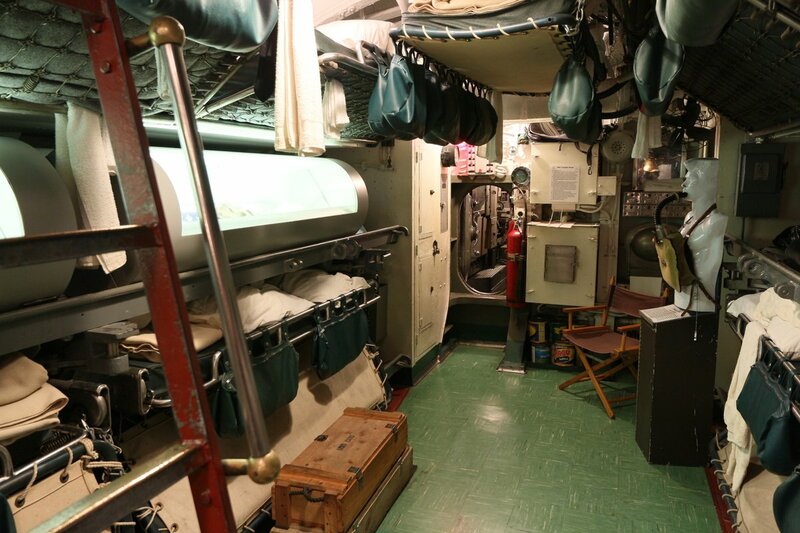 The last compartment holds four torpedo tubes, eight torpedoes and 12 bunks for the crew. The signal flare ejector located on the port side in front of torpedo tubes #8 and #10, works like a miniature torpedo tube. The ejector fires flares or decoy periscope heads to trick the enemy. The Mark 27 Acoustic Homing Torpedo or "Cutie," seen in this compartment is electrically propelled and is intended to home in on the propeller noise generated by an attacking ship. Unlike conventional torpedoes that are blown out of the tubes by compressed air before their engines are activated, the Mark 27 is designed to slowly swim out of the tube so the sound detection equipment is not deafened and the enemy is not alerted by the noise from the rush of compressed air. Since it has to propel itself out of the 21-inch diameter tubes, the Mark 27 is slightly smaller (19 inches in diameter) to allow water to flow around the weapon while it travels out of the tube. Steel rib spacers running the length of the weapon center it in the 21-inch diameter tubes. The Mark 27 is primarily carried in the after torpedo room, which allowed Cod to quietly dive deep, away from the torpedo. A depth switch prevents the torpedo from homing in on the launching submarine. The Mark 27 travels at speeds of about 10 mph for 15- 30 minutes, depending on water temperature and other conditions. The hatch leading up and out of the submarine from this compartment also doubles as an emergency escape hatch. It is constructed with an inner liner that can be slid down to within a few feet of the deck (floor). If the compartment is then flooded from sea the liner will trap the air in the compartment and allow it to compress until it is at sea pressure. At this point the outer hatch can be opened and the crew can swim out of the compartment and make their way to the surface using a Momsen Lung for breathing on the way up. They could simply allow the compressed air in their lungs to exhaust as they rise through the water, but this process is very dangerous since the lungs can be damaged if the air in the lungs is not freely released during ascent. The Momsen Lung continuously adjusts its pressure to that of the surrounding sea automatically, so by simply breathing continuously the ascending crewman will assure that the pressure in his lungs will not be excessive at any time during the escape to the surface. This hatch can also be used, as can the forward torpedo room hatch, to mate to the rubber skirt on the bottom of a US Navy McCann Rescue Bell. You will notice that the deck surface surrounding these hatches is a strong, flat, smooth, steel plate that provides a suitable surface for assuring a seal with the rescue bell's skirt. You will also see four inverted "U"-shaped devices to accomodate clamps that are used to secure the rescue bell to the submarine during a rescue. A Momsen Lung is being modelled by the "dummy" in the after part of this room. This device was invented by CDR "Swede" Momsen, a Naval officer concerned with the problems of escaping from downed submarines. To use the lung it is only necessary to put it on and then fill the attached bag with oxygen from any supply cylinder. This is done while the wearer is at "pressure". That is, after the air in the compartment has been compressed until it is equal to the pressure of the sea at the depth of the compartment. The Momsen Lung will allow the wearer to safely rise to the surface or to pause for a short period at any depth on the way up. It cannot be used to descend nor to remain at a fixed depth for more than a very short time so it is NOT useful as a SCUBA device. Because of its limitations and dangers the Momsen Lung is no longer used aboard modern submarines. It has been replaced aboard US Navy submarines by the Stanke Hood.